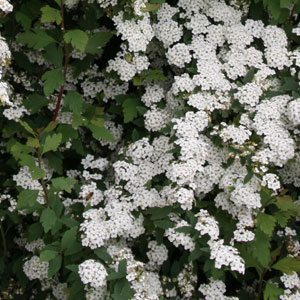 A wonderful free flowering small shrub Spiraea cantoniensis is known as the ‘Double Bridal Wreath Spirea’. It will reach around 2m in height and spread over 2-3m with long arching canes. Covered in masses of white flowers in spring its beauty is when it is left to take its natural form, so give it a little space. This is a deciduous to evergreen shrub depending on the climate. Also known commonly known as the ‘May Bush’. The flowers are in clusters and form masses that almost cover the bush in spring. Spiraea cantoniensis is best planted where its weeping nature can be best shown off. Use it where it can weep from the garden boarder over a lawn. Plat it near a fence where the arching canes can soften the fence line. Or plant it near the back of the border as a background plant for smaller shrubs. It looks great when used with evergreen plants, so try at the back of some smaller growing azaleas. Also useful as an informal border, or hedge in broader landscapes. A humus rich well drained soil is best, keep well mulched to maintain moisture and a cool root run. Full sun is best although a little afternoon shade is OK.
Mulch around the plant to retain a cool moist root run and in warmer climates provide a little more shade. When planting allow space for the plant to grow as over time it will spread to around 2 – 3 metres. Plants can be left without pruning for a few years. Then older canes can be removed, or you can hard prune the whole plant to re invigorate it. Many gardeners prune lightly each spring to keep in shape, most likely an easier way for most. We suggest that after 4 – 5 years you remove a few of the oldest canes each year, this helps reinvigorate the bush. Use in the border, as a informal hedge in a larder garden or a specimen in the lawn. Spiraea cantoniensis ‘lanceata’ ( syn flora pleno) in a named cultivar to look for. Spiraea cantoniensis is available for sale from the following nurseries.